Train your drivers to become good sideloader operators is one of Beltruck’s core capabilities. It is important to point out to novice sideloader operator about the dangers that may occur during container movements. A safety system such as ours: the CSSW (Container Sideloader Safety & Weighing) system should be considered a supporting tool at most. The operator remains responsible for the operation with the remote control. He must always keep focussed on the free-hanging container when lifting. 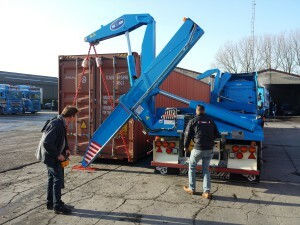 Therefore, every delivery of a new or renovated NICONLIFT side loader is accompanied by appropriate training locally. We will always be present while delivering the sideloader at the client’s location. The training at your location will take two days. After completion of the training drivers may contact us during the first weeks of operation for additional support through phone or internet, including providing ‘tips and tricks’. In the operation control centre the cranebook will be stored. The cranebook contains all documents necessary for operating the sideloader, for example; operating manual, parts list, schematics, inspection documents, registration documents, daily reports, etc..
You may contact us for information about refresher training for your new drivers or new training for an existing sideloader fleet.